As an agency, we use powerful strategies to help our clients penetrate into the market. Our custom content team, design team, and audience analytics team use a scientific approach to create a personalized customer strategy. eBooks are a great way of delivering information on a dynamic platform. Not only can they provide written content but also audio, video, lead generation, and interactivity. Conversely, white papers can educate your clients and expedite their decision-making. We will provide you with credible white papers that will be regarded as valued resources. We are committed to writing excellent product descriptions that pique interests which translate to clicks all the way to the checkout. Our well-trained team has undergone intensive training to create product descriptions that quickly explain a product’s benefits and convince customers why they need it. Since content is everything in today’s market, our copywriting staff understand what resources will adequately connect with the current crop of clients. Other than copywriting, we offer content management. Ever-changing content requires a judicious management system that will organize text, photos, and illustrations in an orderly manner. Our content management services extend to eCommerce businesses which require custom pricing models and need product push replacement. 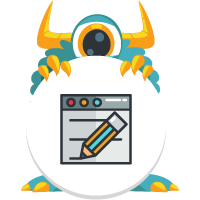 With Monster X, we identify terms that you’re already ranking for in positions 4-30 and push those terms up with a diversified, safe, white hat link building strategy to get you quick increases in traffic. We use advanced competitive research (Competitive Gap Analysis) to find what you’re missing: High volume, low competition, valuable keywords. Then we build out awesome, well-researched content with our Monster Blogger service to target these mid-cycle buyer keywords! We don’t aim to build a set number. Instead we focus on researching and targeting a smaller set of high quality, valuable links. This tactic results in more meaningful traffic, and doesn’t run the risk of being penalized by the search engines due to having built 1000s of spammy links. Building a successful SEO campaign takes time. Although we often view search engines as these all-powerful machines, seeing the impact of SEO efforts can take weeks or even months. Our 3 month commitment allows us to gather enough data to judge how effectively the campaign is working for you. Do you guarantee that I’ll rank in the top 10 in search results? We don’t guarantee rankings for any specific keywords. Our program isn’t built to get your site to #1 for a certain keyword. What it will do is elevate your overall search visibility and drive more organic traffic to your website. After all, traffic is what drives new leads. We can’t make any promises about how many leads you’ll receive. There are just too many variables involved for us to make that guarantee. That said, our goal is to drive qualified traffic to your site which should result in an increase in leads.